Greeks: They are numbers generated by mathematical formulas resulting in ways of estimating the risks associated with options, such as the risk of the stock price moving up or down, implied volatility moving up or down, or how much money is made or lost as time passes. Delta: The amount an option will change in value for every $1 change in share price. The greater the chance of the strike ending up in-the-money, the greater the delta. Delta values run from 0 to 1. Moneyness of options: Describes the relationship between options strike price and the price of the underlying security and determines if intrinsic value exists in an option. We can see that out-of-the-money strikes have deltas under .5, at-the-money strikes have deltas at about .5 and in-the-money strikes have deltas above .5. The deeper out-of-the-money the strike, the closer the delta is to 0 and the deeper in-the-money the strike, the closer deltas are to 1. The 20/10% guidelines are among the most important BCI principles relating to position management for covered call writing. It sets a guideline as to when to buy back an option (close the short option position) when the price of the underlying security drops in value. Since we generate more total premium (not necessarily more time value) for an in-the-money strike, the fact that the delta is higher than for an out-of-the-money strike, premium value will erode faster due to delta and allow us to close the short position in a timely manner should share value decline. The smaller total premiums generated from at-the-money and out-of-the-money options will erode slower also due to delta and therefore keep us from closing our positions too soon. Why aren’t the deltas for exactly at-the-money strikes exactly .5? This is more a point of interest rather than a concept that will influence our trading strategy. Generally a call option will have a delta slightly greater than .5 for an exactly at-the-money strike and a put option will have a delta slightly under .5 in that scenario. This relates to interest rates which make the call more valuable as option buyers can control shares of stock at a lower price and leverage the “saved” cash to earn interest. The greater the time until expiration, the greater the call delta will be in relationship to the put delta. Again, this is an interesting (perhaps not?) fact and I present it to you in case you get an options question on Jeopardy (even Alex wouldn’t know this one!). The impact of delta, which erodes the value of pricier in-the-money strikes quicker than cheaper out-of-the-money strikes, is responsible for allowing the BCI 20/10% guidelines to have universal application for all strike prices. ***Puts show negative deltas because as share price rises, put values decline. The preliminary service sector PMI (an indicator of the economic health of the manufacturing sector) fell to 57.8 in April from 59.2 in March, while the final manufacturing PMI slipped to 54.1 from 55.7, the slowest pace of growth this year. For the week, the S&P 500 declined by 0.6%% for a year to date return of 2.2%. BCI: Cautiously bullish and using an equal number of in-the-money and out-of-the money strikes. The triple digit moves in the market are a bit unsettling and keeping this conservative investor from taking a more aggressive stance. 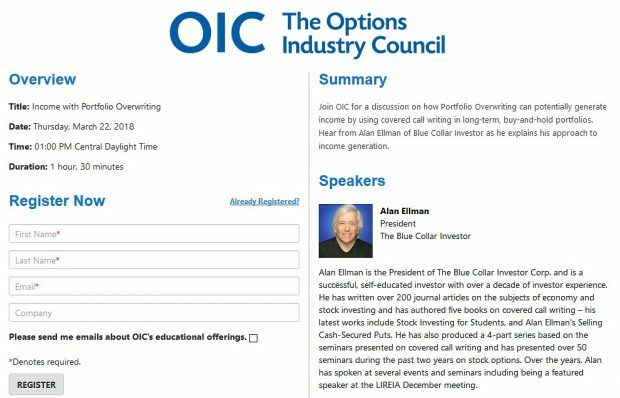 This week’s Weekly Stock Screen And Watch List has been uploaded to The Blue Collar Investor premium member site and is available for download in the “Reports” section. Look for the report dated 05/01/15. How or what do you do to determine what strike price to sell in order not to get the stock put to you. First, determine what your monthly (or weekly, if you use weeklys) goal is for initial returns. My goal in normal market conditions is 2-4% in my accounts (stocks) and 1-2% in my mother’s account (ETFs). Next, look at a put options chain for out-of-the-money strikes (lower than current market value). Go as far OTM as possible while still meeting your goal. Should the strike move in-the-money as expiration approaches (stock price drops below the strike) then buy back the option and the shares will not be put to you. I usually go down the option chain till I get a strike where the deltas are 20 or less is this too conservative for your system at BCI or is it ok naturally I want to make the most money with the least amount of risk I am a big boy I know there are still trades that lose. We have thousands of members and a broad range of risk tolerances. I respect the conservative nature of your trading style and even subscribe to it in certain market conditions. You seem to have a solid command of where you are comfortable selling options and absolutely fit in well with the BCI methodology. One size doesn’t fit all. I did enjoy so much your show on Money Show . However, I was recebntly hired as an options trader with CIBC here in TORONTO. I wonder what blogs or webs you read or subscribe to feed your daily trading. Any webs for earnings or good trusted news or scanner . I always remember you saying that you learned from every mistake you made. Best of luck with your new position @ CIBC. We are fortunate to have many members from Canada. According to your Passed screen stock listing for this week CRM has no ER for this month. But Yahoo lists the ER will be on May-20. Please verify. As you can see in our latest stock report, we are on the same page with the 5-20 projected earnings report date. In these reports, we break down eligibility by CONTRACT MONTH not calendar month. The May contracts expire on 5-15 so CRM is eligible for the May contracts but will not be eligible for June contracts until the report passes. Please also note the black line in the “running list” between RAX and CRM delineating eligible stocks between the May and June contracts. How do you use covered calls in a bear market? Inverse ETF’s? With IV as low as it is, it’s difficult to sell options for any adequate premium. If you have addressed such questions, just direct me to the video. I rarely turn to inverse ETFs although it would have been a good idea in 2008. Even on down days like today the market usually recovers quickly. My main go-to strategy in short-term bear or volatile market conditions is to use in-the-money strikes that give additional downside protection. I am currently using 50% in-the-money strikes as I have been stating for the past few weeks. The Complete Encyclopedia…has over 50 pages of exit strategy material which I expanded on from my first book. You can also use the google search tool at the top of our web pages for free articles on a myriad of topics. In your newsletter you regularly mention the trend followed by the selection of covered call strike, whether ITM, or OTM. 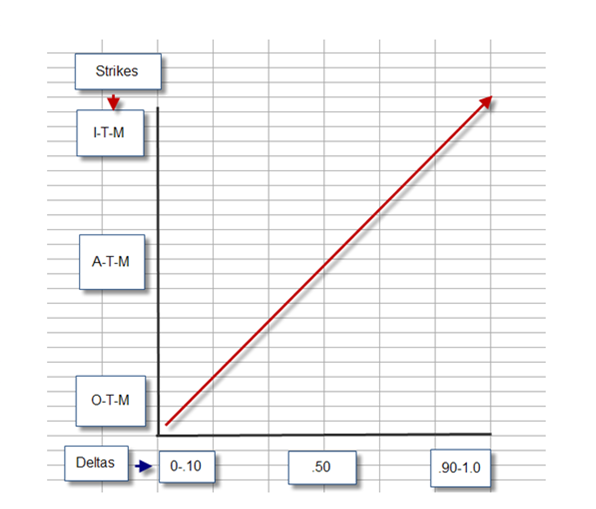 When selecting the ITM strike, during the period when the trend is bearish, how many strikes ITM do you select as a general rule? Could one be content with just doing the ATM covered call, irrespective of the trend? The more bearish or volatile the market conditions are, the higher the percentage of ITM strikes and vice-versa. I am currently at 50% ITM but that may increase or decrease depending on market action Thursday and Friday. This percentage will be archived at the end of our weekend blog article and in our Premium Member Stock Report. Using all ATM strikes is not appropriate in my view. ***With the markets declining the past 2 days many of us closed our short option positions using the 10% guideline since we are in the 3rd week of a 4-week contract. Nice work. Since most positions were impacted by overall market sentiment rather than specific stock news, rolling down to a lower strike seemed to have been the follow-up strategy of choice based on emails I have received. To those who closed the short positions but did not roll down or sell the stock, waiting to see how the market opens tomorrow before deciding on a definite plan is not unreasonable. If there is a strong rebound, hitting a double is unlikely but possible. Cirrus Logic reported a stellar 4th quarter earnings report on April 28th, beating market consensus by 40% ($0.66 EPS compared to expectations of $0.47). As a result guidance was also elevated through the 1st quarter, 2016. CRUS is a key supplier of sound technology for Apple Computer and 78% of the 4th quarter revenues came from its relationship with Apple. This may be a concern to some and a bonus to others. Our premium running list shows that CRUS is in the “Chips” industry currently ranked “A”, has a Scouter Rating of “7”, a beta of 0.79, weekly options available, adequate open interest for near-the-money strikes and a projected earnings report date of 7-23-15. Have a look at the beautiful technical chart since December, 2014 when the 20-d ema crossed the 100-d ema (green arrow). CLICK ON IMAGE TO ENLARGE & USE THE BACK ARROW TO RETURN TO BLOG.